It can be difficult to know what to say in an apology. Everyone makes mistakes, and some may affect your partner. Admitting that you were wrong and apologizing for it seems simple enough. Although a sincere apology can serve as healing balm for a bruised relationship, an insincere apology can inflict harm, says psychologist Aaron Lazare in the Psychology Today article “Go Ahead, Say You’re Sorry.” Make the effort to give your partner a heartfelt, appropriate apology when you’re wrong. You want to make things right with your partner. 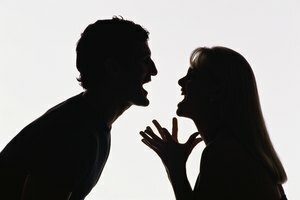 That’s good, but don’t initiate an apology without giving your partner some time to get over the hurt, recommends psychologist John Grohol in the Psych Central article, “How to Make an Adept, Sincere Apology.” Give your partner one or two days to regain emotional equilibrium following an offending incident. Use this time to take an empathetic look at what you did and the effect your behavior had on your partner. Based on this experience, think about what you should include in your apology. Apologize in person, suggests the article, “The Perfect Apology.” Be specific about what you are apologizing for and carefully omit phrases that suggest that your partner shares some of the blame, such as, “I’m sorry if you misinterpreted what I said.” Be clear that you assume responsibility for your mistake, and address your understanding of how your mistake has hurt your partner. Express regret for hurting your partner and remorse for making a bad decision. After submitting your sincere apology, ask your partner what you can do to further atone for your blunder, and then do it with a smile. Your partner may or may not accept your apology; do not pressure your partner to do so. A surprise such as dinner at your partner’s favorite restaurant or movie tickets may not hurt, but gifts are never a substitute for a heartfelt apology. A lovingly executed apology is a wise investment in your relationship. It repairs the damage inflicted by your mistake, rejuvenates your relationship and enhances the level of trust with your partner. Apologizing doesn’t signal weakness, notes Aaron Lazare. Don’t let your pride and fear of shame prevent you from embarking on an opportunity to strengthen your relationship. You demonstrate strength and a commitment to the relationship when you acknowledge your mistakes. Swain, Becky. "How to Apologize to Your Partner When You're Wrong." Synonym, https://classroom.synonym.com/apologize-partner-wrong-20582.html. Accessed 20 April 2019. How Can I Gain My Boyfriend's Trust Back?